Max Impact is the premier rock band of the United States Air Force. Stationed at Joint Base Anacostia-Bolling in Washington, D.C., it is one of six musical ensembles that comprise The U.S. Air Force Band. This six-piece band performs classic and current rock and country hits, as well as patriotic favorites and original music. Through national tours, local performances and digital audio and video recordings, Max Impact showcases Air Force excellence to millions each year. Back at home, they support events for the White House, State Department, Department of Defense and numerous other high-level military and civilian functions, using music to advance international diplomacy with America’s allies and strategic partners. In addition to entertaining military and civilian audiences in the United States, Max Impact thrills service members with its trademark high-intensity, hard-rocking vivacity and musical versatility at forward deployed locations. These performances are a much-needed “taste of home” that bolster troop morale and esprit de corps for remotely stationed military members. Additionally, the band supports the Air Force and its local communities by creating innovative projects and performances, capitalizing on the latest in multimedia and technological advances in music production. At home or abroad, their high-energy performances assist in enhancing troop morale, building partnerships with local, national and international communities, increasing recruiting and retention efforts and inspiring patriotism using effective and powerful music. 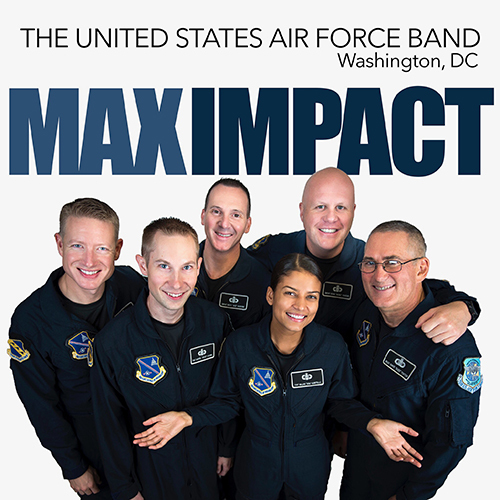 As part of The U.S. Air Force Band, Max Impact honors those who have served, inspires American citizens to heightened patriotism and service, and positively impacts the global community on behalf of the U.S. Air Force and the United States. The excellence demonstrated by these Airmen musicians is a reflection of the excellence displayed by Airmen stationed around the globe. Each member is proud to represent all Airmen, whose selfless service and sacrifices ensure the freedoms we enjoy as citizens of the United States of America.